It happens to the best of us, even on our best days. Don’t you have that person who shows up on your newsfeed, or walks in the room, and as soon as you see them you get possessed by the green monster. Suddenly you feel nothing by overwhelming envy and a tint of anger that they have what you wish you had. Jealousy is such an embarrassing feeling to have and it is one of the major setbacks when you are working hard on your quest to self-love. Here are a few tips on how to handle it when you can’t seem to shake it off. Think of your feelings as a liquid, you as a drainer. When you refuse to admit to yourself that you are jealous, you close the holes of your drainer and the unwanted liquid just linger in you and poisons your mood the longer it’s there. Honesty with yourself allows you to open up, poke more holes in the drainer so the poisonous liquid flows out quicker. Honesty counters the shame that quickly puddles in you, when you’re trying to pretend you’re not overtaken by jealous. By admitting to you that you are jealous, you let the shame flow out of you. Take the time to recognize and acknowledge the feeling and admit you’re jealous. You don’t have to say it out loud to anyone, just be real with you. Being a good person doesn’t mean you never feel anything negative, it’s about knowing what to do with the bad that arises out of you. An important step is to recognize that you are human and forgive yourself for having this natural, yet uninvited feeling. 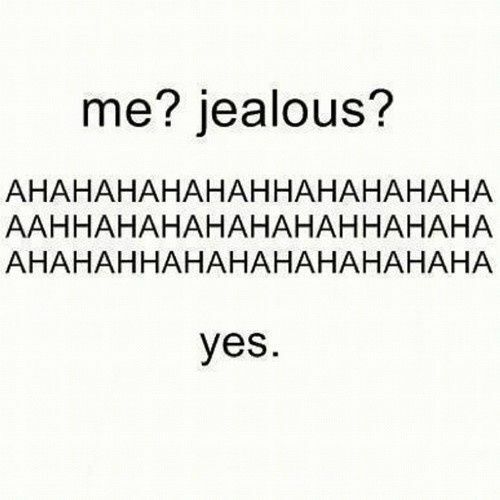 It’s absolutely ok to be feeling jealous of someone else even if you wish you didn’t. Take a deep breath and send someone love to that knot that formed right there in your chest, and let it untie itself. Give An Honest Compliment to Counter the Jealously. When you see someone whose body, strength, flexibility makes you jealous, make the effort to give them a genuine compliment on that very thing which you envy. Note that I said genuine, because you can easily resort to giving a backhanded compliment which only worsens the very feeling you’re trying to shake off. Take a breath, give them a heartfelt compliment, and you can even admit to the person that you are envious of the quality they have. Taking this step allows you to realize that there’s room for you both and their awesomeness doesn’t have to dim your light. Plus, giving a positive comment takes you out of the negative funk jealousy can easily sink you in. Jealousy happens because you’ve tied your value to whatever you envy. You are convinced that you will be more worthy of love if you can get that person’s abs, or their muscular legs, or a more flexible back for the ultimate scorpion pose. Remind yourself that while those are great things to aspire to, they are not your entire identity, and therefore not your entire value. You are more layered and complex that being only valuable for great abs. Don’t allow your worthiness to be reduced to only one attribute. Jealousy often comes from the idea that you could never have what that person has. Asking for pointers to get what you envy, helps to move you from an impossibility you can only admire, to an attainable goal. What is the workout routine to get those abs? How does she practice self-love? What did he do for upper body strength? You then stop being jealous, and start getting in the grind. while you can ask for advice to get what that person has, it’s important to recognize your own strengths so you don’t get consumed in only yearning for what someone else has. Counting your blessings allows you to proceed from a place of love and compassion for yourself, rather than self-loathing. Self-hate is a short term motivator with destructive habits, while self-compassion and affirmation builds a more sustainable action plan to build your best life. You will soon find yourself being able to be more generous with compliments, and being able to recognize that there is room for all of us. Jealousy will still arise from time to time, but you will notice that it lingers a little less because you’ve learned to not attach your identity to that which you envy.